The company’s revenue climbed 55.9% at Rs1,182cr in Q4 of FY19. Shares of TV18 Broadcast slumped 6% on Monday despite the company’s posting a profit od Rs29cr in Q4FY19 compared to Rs3cr in the same period a year ago. The company’s revenue climbed 55.9% at Rs1,182cr in Q4FY19. The company’s EBITDA rose 14.4% to Rs51.7cr, while margin declined 4.4% vs. 6% in the same period a year ago. 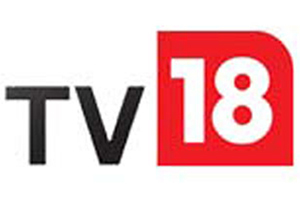 TV18 Broadcast Ltd's share price is currently trading at Rs36.60, down by Rs1.9 or 4.94%, from its previous close of Rs38.50 on the BSE. The scrip opened at Rs38.80 and has touched a high and low of Rs39.30 and Rs36.10, respectively. So far, 2,13,54,808 (NSE+BSE) shares have been traded on the counter. The current market cap of the company is Rs6,600.29cr.